Farberware has been trusted by families for over 100 years, and this versatile dishwasher safe covered straining saucepan continues that tradition for a new generation with easy cleanup after every use. Making it easy to cook and strain foods without the need for a colander, the Farberware Dishwasher Safe Nonstick Aluminum 1-Quart Covered Straining Saucepan with Pour Spouts features two pour spouts and a convenient straining lid. Rotate the shatter-resistant glass lid to align the holes with the spouts to pour out water after boiling potatoes or blanching vegetables. Or cover the holes to seal in heat and moisture to cook jasmine rice and more. 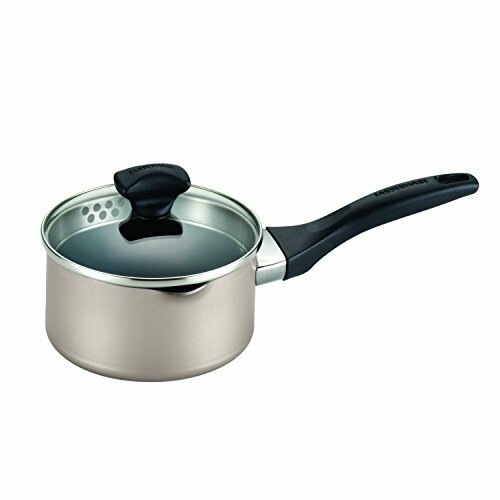 Constructed from heavy-duty aluminum that heats fast and evenly to help reduce hot spots that can burn foods, the saucepans interior features long-lasting DuPont Teflon Plus nonstick for effortless food release and easy cleanup. And the double-riveted handle provides a confident grip when pouring a thick ragu into a serving bowl. Oven safe to 350 DegreeF, this straining saucepan complements skillets, sets, and many other items throughout the Farberware collection. The versatile Farberware Dishwasher Safe Nonstick Aluminum 1-Quart Covered Straining Saucepan with Pour Spouts is great for both covered cooking and to strain liquids from prepared foods.